Veritas: Picking up the cats from Sarah's place. _MAL0483, originally uploaded by Michael A. Lowry. After coming back from Kittelfjäll, I went out to Hässelby to pick up the cats from Sarah & Tomas. They fixed a lovely meal of Leila's Moroccan hamburgers. Sarah told me that Alex woke them up with his meowing the first night, but that he calmed down a bit the following night. He's such a troublemaker. But he's also adorable, so I put up with him. 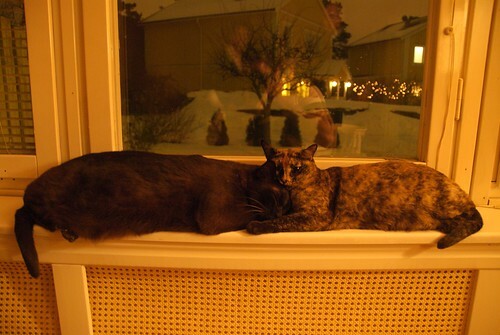 As we ade dinner, Alex and Sasha laid on top of the shelf above the radiator. They always find the warmest place in the house to sleep.